The last of Hailey Mullock's series on decoration in manuscripts of Lydgate's Troy Book. The Hierarchy of Decoration within the Troy Book text in British Library MS Royal 18 D II appears to be integral to the text. In order to determine how integral the decoration was to the text or if it was integral at all, I compared Royal 18 D II to other manuscripts that contain the Troy Book text. There are currently twenty-three manuscripts that contain John Lydgate’s Troy Book, eight of which are illustrated, “and a basic visual program can be detected in each of them” (Whitehead v). 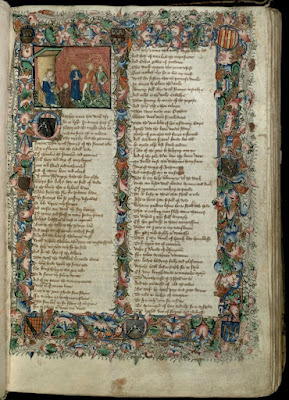 Of those twenty-three, only three digital facsimiles are available on the Web at this time: of British Library MS Royal 18 D II; Cambridge, Trinity College, MS O.5.2; and Cambridge, Massachusetts, Houghton Library, Harvard University MS Eng 752. In examining these three manuscripts, it appears that the hierarchy of decoration is not consistent or integral to this particular text, as the manuscripts vary in decoration. However, further research into the inaccessible manuscripts shows that most of the time the manuscripts containing the Troy Book text have a hierarchy of decoration similar to both Royal 18 D II and Trinity O.5.2. The majority of the manuscripts contain similar decoration at the beginning of each book and the decorations are all in the same order of the hierarchy in each manuscript. The beginnings of the books are marked by an illustration, border decoration, and a large display initial following the illustration. What is even more interesting is that although the illustrations are not always identical, the subject and placement of the illustrations are the same for the majority of the manuscripts. It is possible that there was a presentation copy, an exemplar, from which all of the illustrations were copied.